Democratic victories: Liberals notch political victory on Keystone, and appear poised to do the same on immigration and Net Neutrality. Harry Reid had a good day on Tuesday. 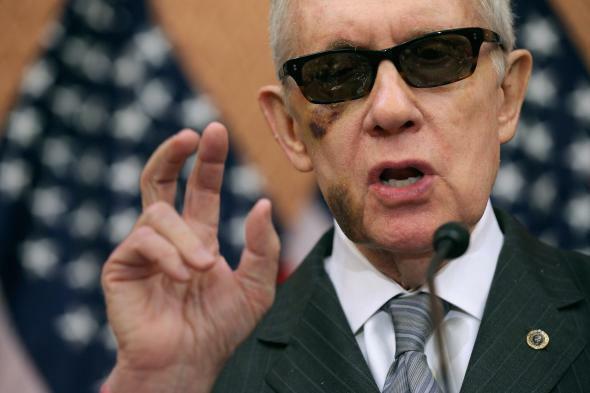 On Tuesday, patience began paying off for Reid’s battered party as Democrats notched several political victories. First came the strongest sign yet that congressional Republicans have badly misplayed their hand in the fight over President Obama’s immigration reforms; then a presidential veto of the GOP’s Keystone bill; and, in the late afternoon, the news that Republicans have effectively given up on fighting net neutrality, paving the way for the FCC, later this week, to approve regulations that would treat the Internet as a public good. All in all, that’s a pretty great day for a man who is still regaining vision in his right eye and for a party that controls neither chamber of Congress. Still, sometimes playing a bad hand will win when the other guy misplays a stronger one—something the ongoing immigration fight illustrates. For the most part, Democrats have simply sat back and weathered the storm as Republicans pressed on with plans to tie funding for the Department of Homeland Security to efforts to block Obama’s high-profile reforms. The GOP plan was DOA almost as soon as it was hatched late last year, yet Senate Republicans waited until this week—with only days left until funding for the agency expires—to pivot to a plan B that still appears to be a long shot and that in their realistic best-case scenario ends with the DHS funded and Obama vetoing their efforts to block immigration reform. Of course, a victory today doesn’t guarantee one tomorrow. Democrats know there is serious trouble on the horizon in the form of two lawsuits that could hand Republican lawmakers the wins they have been unable to produce for themselves of late. The 5th U.S. Circuit Court of Appeals will most likely decide whether or not the White House can indeed press on with the immigration reforms that Republicans are currently attempting to undermine. And that case is arguably small potatoes compared with the one the Supreme Court is set to hear next month regarding whether people who got insurance through the federal exchanges can keep their subsidies. If the White House loses either of those legal battles, its allies in Congress will no longer be able to claim victory by simply avoiding defeat. But for this week at least, Reid and co. can do just that.